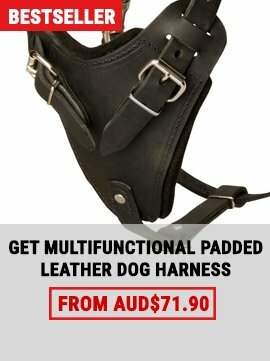 Take Your Dog Walking in a Leather Dog Harness! We have beautiful fancy Custom Dog Collars, Dog Harnesses, Leashes and muzzles! We offer many typies from basic leather harness to profetion training dog harnesses design! 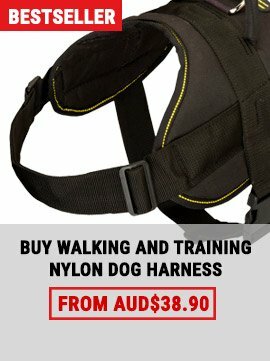 Get your dog a new fancy harness or collars today from Dog-harness-store.com! Hand Make leather dog harnesses from here , our harnesses are made from the finest bridal leather, all collars leads and harnesses that we stock are made using traditional methods , they are hand cut and hand stitched using the finest quality leather, buckles, rivets and fittings, all of our products are made by craftsman who have many years of experience. 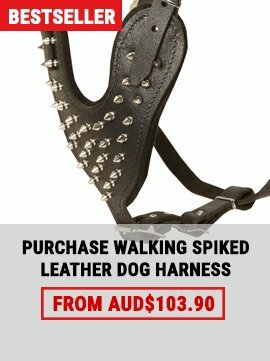 Looking for Fashion Leather Dog Harness in Black is the perfect accessory for your small dog. Made from a durable this harness has a metal loop on top so attaching your dog leash couldn’t be easier.